When recycling and waste is discussed, the images that are conjured are that of glass bottles, polymer containers, newspaper and aluminium cans. This is the face of waste, post-consumer, the face that we see when we discard our used packaging. What this idea of ‘waste’ fails to address, is the waste generated during the manufacture of these and many other products, and the whole design itself; the design that requires the user to discard a part of the item. As waste is intrinsically linked to design through manufacture and user interaction, there is a level of responsibility, to rethink what is designed, and address the inevitable waste created by these designs. Increasingly designers are looking at the issue of waste during production, pre-consumer. Modern production methods have become quite efficient, although the use of more traditional production methods, from wooden furniture, to traditional building construction still leave us with masses of waste. 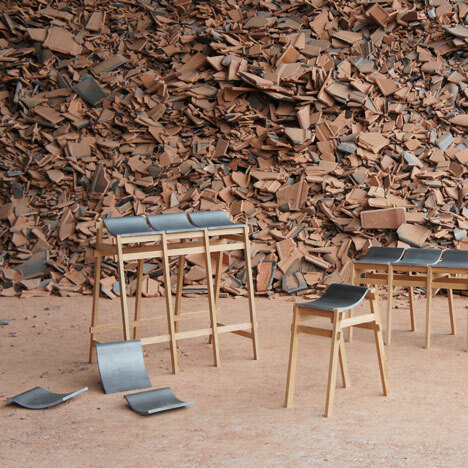 Eindhoven graduate, Tsuyoshi Hayashi is one designer addressing the issue of waste in the construction industry; Kawara tiles. Kawara tiles are the traditional roofing tile in japan, although during manufacture, more than 65,000 are sent to landfill each year due to minor blemishes. Hayashi has addressed this problem by reappropriating the tile to create seating, an artefact not so easily discarded. The chinese studio Bentu Design also understands the issue of construction waste, stating ‘construction waste accounts for 30–40% of the amount of total municipal waste. It takes up a lot of land and reduces soil quality’ (DesignBoom, April 2015). Bentu Design uses this waste to create something of value, unlikely to be discarded, with their series of lighting. Bentu’s approach of leaving the material raw and unpolished is effective as a reference to its origin and creates a talking point concerning construction waste and how we approach it. Both of these designs have re-appropriated waste into a form that will be valued and cared for, rather than discarded again, over and over, such is the current situation with various plastics (although reducing the need to produce more polymers, it is also cyclical, creating work in the processing and collection stages). Perhaps there needs to be a combination of both recycling and re-appropriating, as there are many merits to plastic recycling, such as energy savings (200% more energy required to incinerate a plastic drink bottle rather than recycling), although some plastics LDPE, Acrylic and Nylon that are not currently recycled, could be re-appropriated using the principles above to create something of value, not something to be continually discarded. @zachanna On the topic of plastic bottles, have you seen recycled plastic bottle board shorts? Check this blog . Although I am pretty sure they would have to melt the plastic, what do you think? Great post Zach. Its a shame that the general consumer is ill educated about not only the waste when they discard the product, but also the waste pre production. At a time while up-cycling is becoming fashionable, maybe there is more of a market for these discarded materials pre production to be used more often. Maybe the concept should be interdisciplinary; discarded plastics could be made into art. Off cuts of wood could be used as ornaments, to smoke produce in cooking or used as mulch in the garden. Scrap metal could be melted to create cutlery, the opportunities are endless.